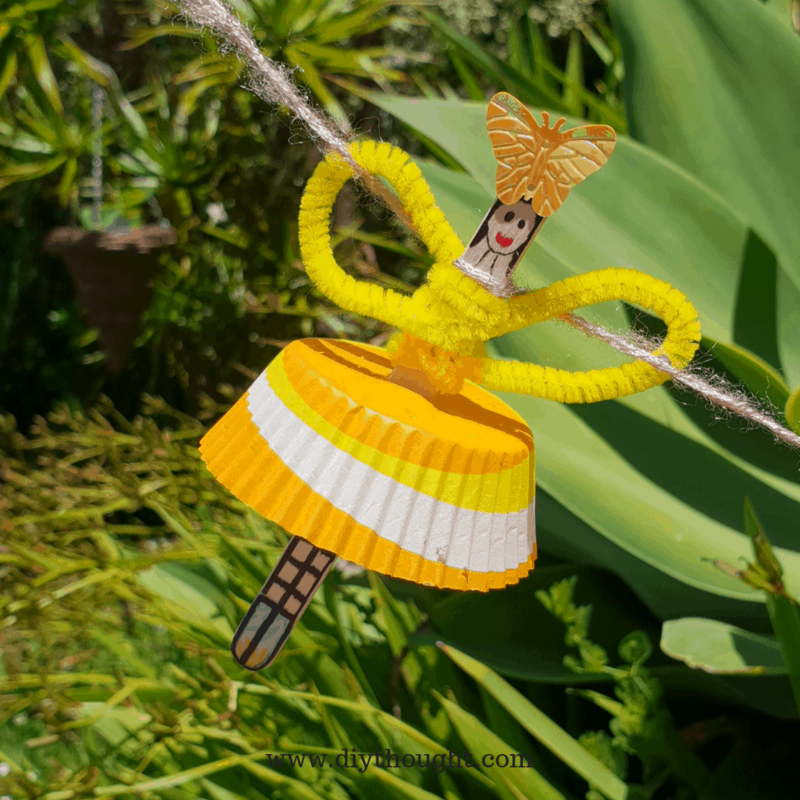 Today we are making a DIY popsicle stick fairy garland. Garlands are perfect as a party decoration or are a great way to update a bedroom. 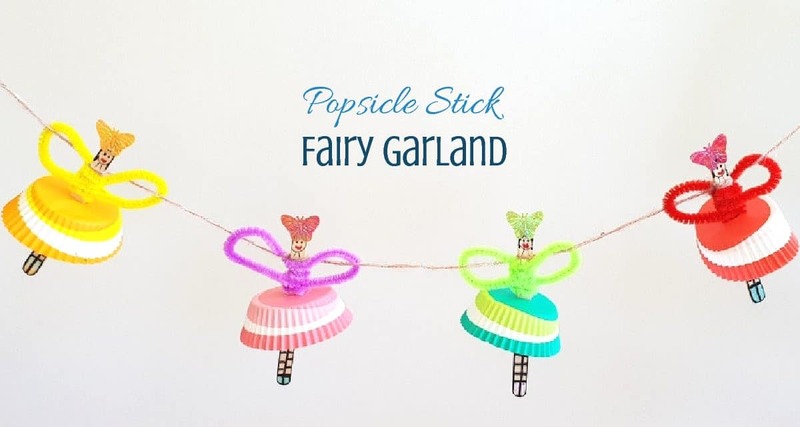 If you know someone who loves fairies it is a safe bet that they will love this fairy garland! 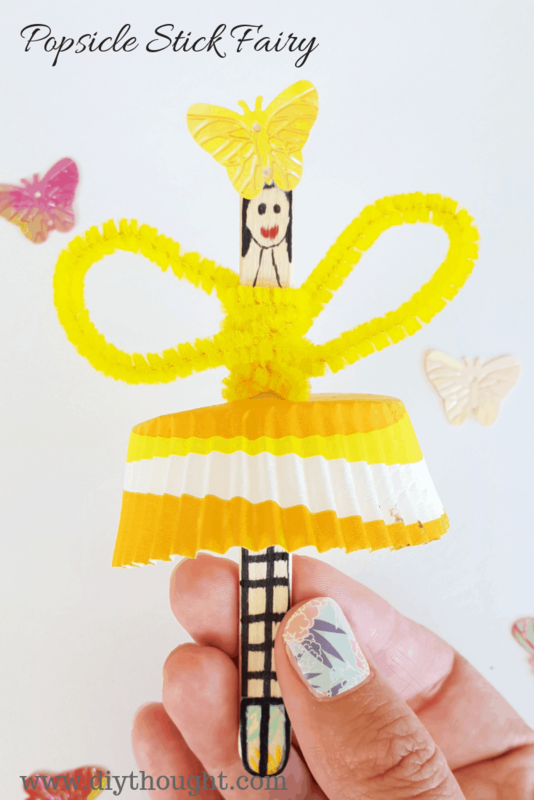 Not only is it super cute but it is a great craft project for kids as it is easy and fun to make. This DIY popsicle stick fairy garland now hangs proudly in Miss 4’s bedroom. She thoroughly enjoyed this craft and her sister couldn’t wait to make her own when she got home from school. This is how we made it. Small craft butterflies or other small head accessories such as flowers or mini pom poms. 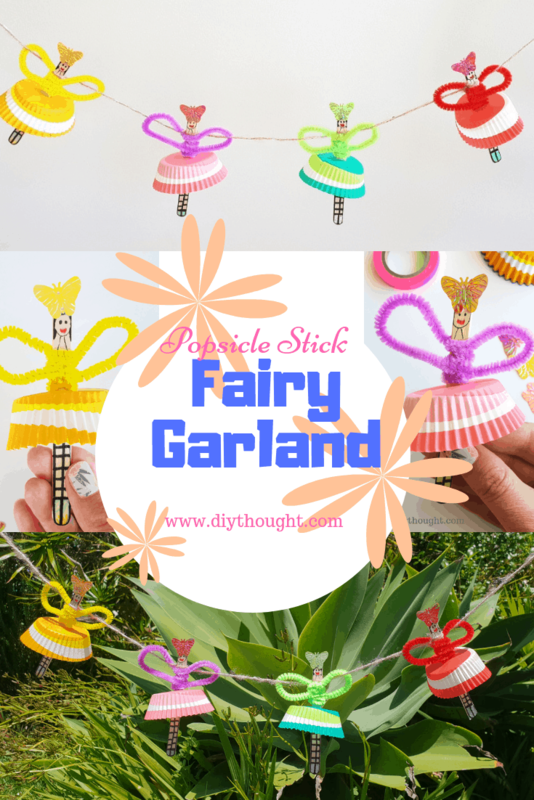 This fairy garland is a lot of fun to make! If you are missing an item, no problem, just improvise. Craft paper could make lovely wings or fabric as a dress. Half the fun is being creative. Starting with a popsicle stick draw on the legs with a sharpie pen. At the bottom add some washi tape feet and remark with the sharpie. 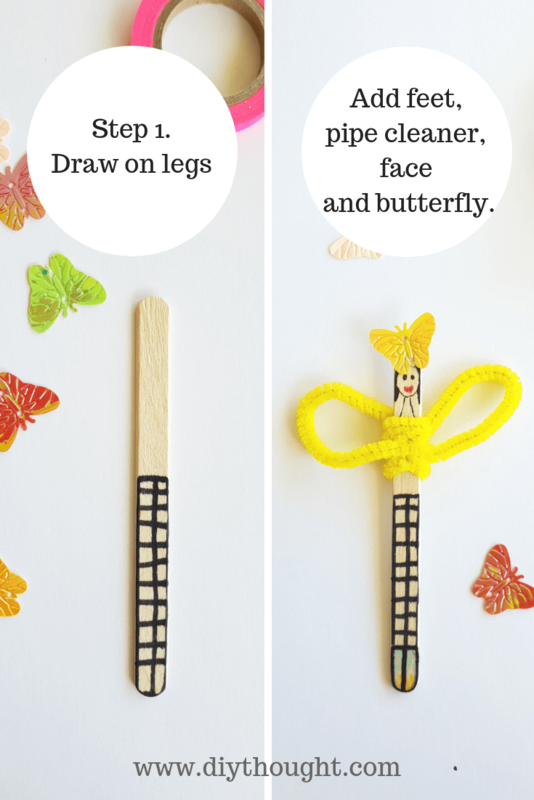 Twist a pipe cleaner around the center of the popsicle stick and bend wings into shape. 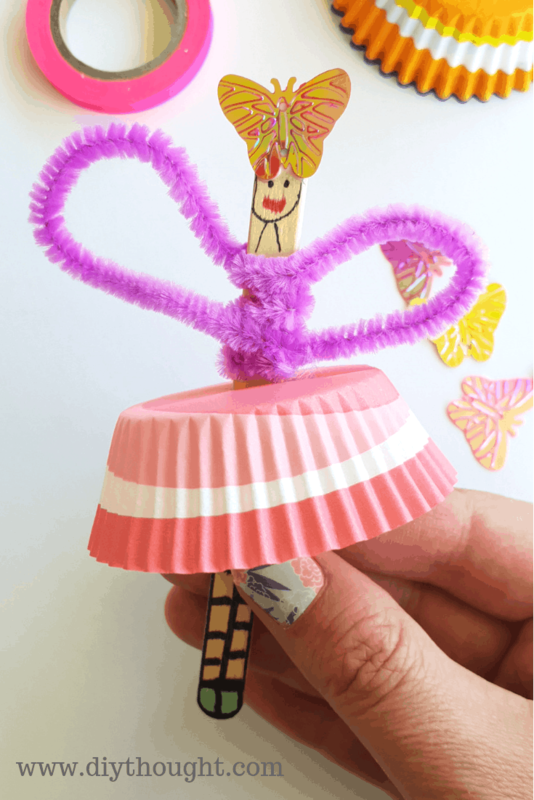 Draw on face and neck above the wings but leaving space at the top of the popsicle stick. A circle, two eyes, and a smile and hair if desired. Glue on a craft butterfly or other decoration above the face. Carefully cut a silt in the center of the cupcake case. Insert the craft stick feet first and bring up to the pipe cleaner wings/ body. Tie a length of yarn onto each of the fairies. We tied it about the pipe cleaner, knotted at the back and threaded through the wings. 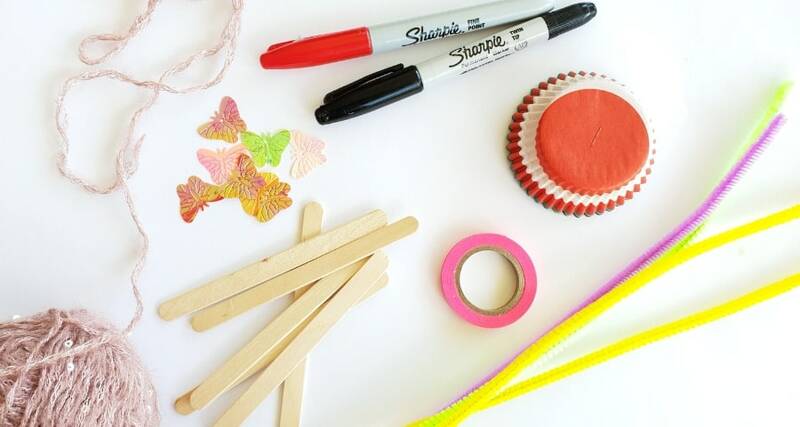 If you make this DIY popsicle stick fairy garland we would love to see a photo of it. Find us over on Facebook.